Richmond park with it's numerous walks, cycle hire and 650 deer is a short bus ride way. 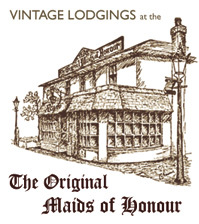 Vintage Lodgings is self-catering studios accommodation above the world famous ‘Original Maids of Honour’. It is the perfect Bed and Breakfast in Kew, London. Set on the Kew Road, The Original Maids of Honour boasts a history almost as long and colourful as its’ surroundings. Following a leisurely breakfast downstairs at the Maid’s you are only 2 minutes walk from Kew Gardens – a World Heritage Site, a 10 minutes walk to The National Archives or 5 minutes to Kew Gardens tube with it’s links to central London and Richmond. Apart from the convenience of being 5 minutes walk from Kew Village with it’s eclectic mix of shops and restaurants, and 2 miles to the beautiful town of Richmond on the banks of the Thames, staying at Vintage Lodgings brings a little bit of the past to life. It all began with the Maid of Honour cakes. It is believed that Henry VIII, King of England (1509-1547), came across Anne Boleyn and her ladies-in-waiting (Maids of Honour), eating the cakes from a silver dish. Tasting one for himself, Henry was so taken by its ‘melt-in-the-mouth’ sensation that he demanded the recipe be kept secret and locked away in an iron box at Richmond Palace. The first Original Maids of Honour shop can be traced back to the early 18th century and the business has been running until the present day. During World War II (1939-1945), the building that housed the bakery, shop and dining room was badly bombed during the Blitz, although was quickly rebuilt in the more fashionable Mock Tudor1940’s style of the day. Vintage Lodgings bed and breakfast in Kew has a retro 1940’s style, in keeping with the more recent history of The Maids of Honour. It offers visitors a little piece of British history and hospitality.